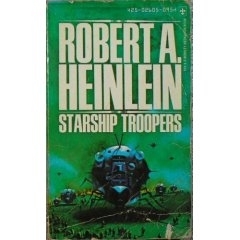 Heinlein's futuristic coming-of-age military novel has been the acknowledged inspiration of everything from other literary s-f classics to the most popular of Japanese giant robot anime series, Mobile Suit Gundam. Those who have only seen the 1997 motion picture by Paul Verhoeven may be surprised to find that Heinlein's novel is less about militarism than about service to one's community and to humanity. In a future in which a Terran Federation has reached the stars, humanity is at war with a spider-like civilization called "the Bugs", Juan "Johnny" Rico is a pampered teenager in a culture that requires people to take part in Federal Service to be eligible to vote or serve in the government, which most consider a waste of time and do not bother with. Heinlein's model was the required national service in Switzerland, but in time of war most service may be in the military, like it or not. Johnny Rico volunteers for the Army, partly as an act of teen rebellion against his father and partly under the influence of his teacher Lt. Col. Jean Dubois. Most of the novel is set during Johnny's experiences in boot camp and undergoing his first combat missions against the Bugs, and as a series of moral and politico-philosophical discussions between the naïve Johnny and his more experienced elders, Dubois in the classroom and Drill Sgt. Zim in the military. The experienced arguments are seen as a mouthpiece for Heinlein's own views, which were that peace without being prepared to fight for it is unrealistic. Johnny comes to understand and accept these views intelligently as distinct from being brainwashed as his father charges.